This week’s meal plan includes some Easter and Passover dishes. I also created a recipe for Hot Cross Buns using the easy bagel dough which I will share tomorrow. Enjoy your weekend! I have been using your meal plans (out of order depending on what I feel like having any given week) and just wanted to say a huge thank you! today I hit my first target of “getting into the 140lb range” which is HUGE from my starting weight of 178lb. I don’t find myself missing food as it is WAY better food than what I was eating, and the portioning is a habit that has literally changed how I eat. Thanks again! I look forward to your weekly meal plans. I work full time and go to school part time so this saves me a lot of time planning my meals out for the week. They also help me stay on track for my daily WW points. Don’t stop. 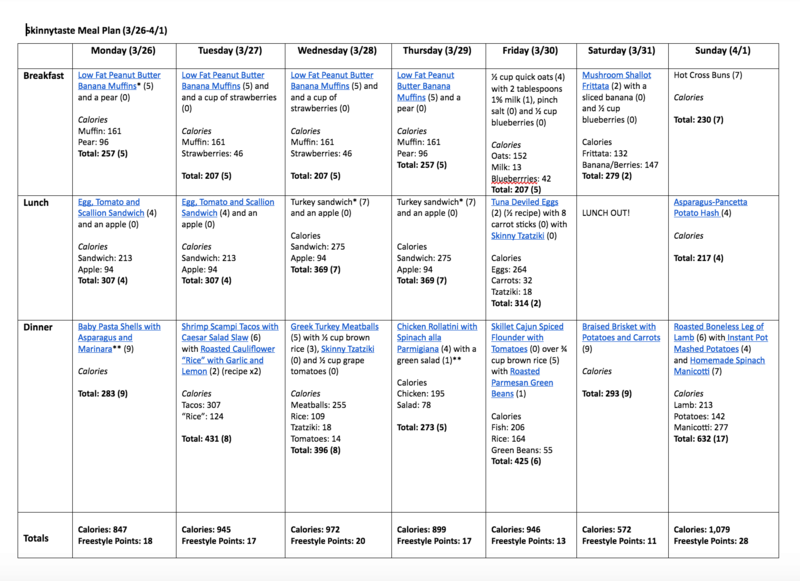 Loved this week meal plan!! !Thank you for posting these … gets us to try new things, the points are very helpful and always delicious! Love these plans! Please keep it up, and the shopping lists are amazing!! This is so great. I am so happy you include a shopping list and are weight Watcher friendly. I can’t wait to get started. 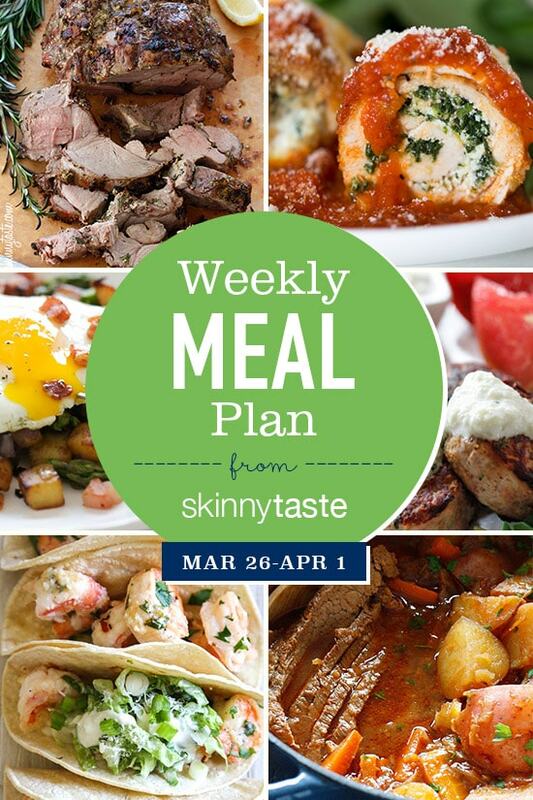 We love your weekly meal plans WITH the shopping list! you have saved me calories and money! So much needed a meal planner already to go. I have run out of ideas,, and when you run out of ideas you gain weight which I am not trying to do. Thank you so much! I am just getting started with trying to do meal planning for my family. This is a wonderful example and I’m excited to try it for the week! Thanks for including the grocery list and the link to the google doc. This is a fabulous resource! Love your weekly meal plans. They help this busy mama out so much. What a blessing that you already worked this all out!!!! Thank you for the meal plan! I love the meal plans, but would like a just dinner option, such as the shopping list with just dinner ingredients, etc. Thank you! I have been using the meal plans. I love the recipes and especially the grocery shopping lists. These have really helped me to include a wide range of delicious food and save time in my busy schedule. Thank you Gina! Keep them coming! Just found your site and love. When I put in the statistcs for the chicken rotallini it comes out to 6 points , do you know why the difference? Are your cookbooks available in hardback or only ebooks? They are available as hard covers on Amazon. Love the meal plans!!!! Thank you!!! So glad I found your page. I have been looking for a meal plan already laid out and easy to use. Can’t wait to start trying your recipes. Thank you!! I need to get busy and loose some weight for our cruise to Hawaii in September so I’ll defiantly be using this meal plan. Thanks so much for making it so convenient for all of us Gina!! Thanks for linking to Google Docs. I absolutely love your meal plans. Thanks again! I love the link to Google Docs! Thanks for sharing.